You can now set several Acronym Finder search defaults using our new preferences page. Default sort order (rank or alphabetical). If you prefer to show Acronym Finder search result sorted alphabetically instead of by rank/popularity, use this preference. Number of results per page. Use this preference to set the number of search results per page. The default is 20, but you can set it to as few as 5 results per page, or as many as 25 per page. Default category tab. This setting allows you to choose a different default category (filter) for your searches. For example, if you almost always search only acronyms from Science and Medicine, you can use this preference to make that your default category tab/filter. If you set another category tab as the default, you can still switch to the show all tab. In only one result, use direct link page. Use this setting if you prefer to see a more streamlined result page when there is only one result for your search. Since setting your preferences requires cookies, this means that if you want to use preferences, you'll need to do so for each computer or each browser you use. Be sure to let us know if experience any problems with preferences or there are other preferences you would like to see. Google has released a beta version of their newest toolbar (only available for Internet Explorer for now). The new toolbar has many new features and supports Custom Buttons. We've created a Google Toolbar Button for Acronym Finder. Click here to install it. You must have Internet Explorer to use this beta Toolbar. If you don't have the latest Google Toolbar, clicking the install link above will allow you to download and install it and then installation of the Acronym Finder Custom Button will continue. In our Custom Button, we've also included a drop-down of feeds from the What's New section of this blog. Click the downward-pointing black triangle to the right of the button to see the latest Acronym Finder news. Type an acronym or abbreviation to search for in the toolbar's search box, then press the Acronym Finder button. Highlight/select an acronym on any web page and then press the Acronym Finder button. Create other buttons. If you have the latest version of this toolbar installed, you can create a custom button or search button for almost any site, by right-clicking the search box on that site, clicking on "Generate Custom Search..." and then follow the directions. This feature allows you to create a custom Google Toolbar button to integrate the search of almost any site into your own installation of the toolbar. Google has a Toolbar Gallery of other buttons you can install. There's also information available to help you learn to create your own buttons. FTIR is one of those science abbreviations that doesn't really convey what it's about, but it turns out to be very interesting. FTIR stands for Frustrated Total Internal Reflection and it's a touch-sensing technique used in biometric applications like fingerprint image acquisition. In this case, we learned that FTIR technology is being used to develop multi-touch interaction with a graphical display system. Touch-screen systems we've seen pretty much only allow you to point and tap with a single finger or stylus to do something. 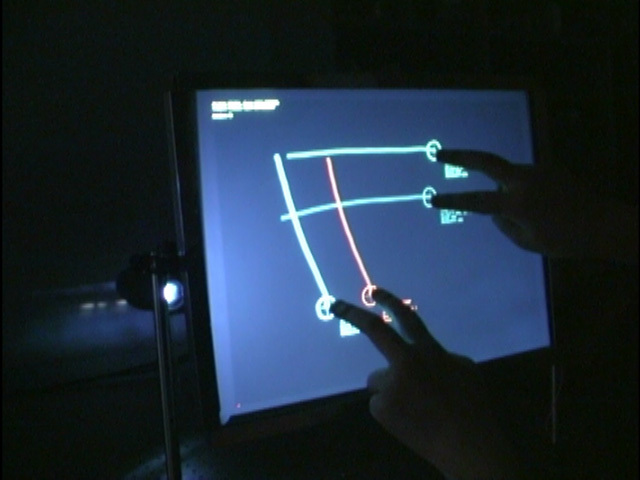 But multi-touch interaction allows the user to use more than one finger at a time so that a user could use several fingers on one hand or even multiple fingers using both hands! Jefferson Han, at the Media Research Laboratory in New York University's Department of Computer Science has a page which illustrates the FTIR technique and another page with demo images and video of FTIR displays and applications in action. Very cool stuff. This reminds me of some of the user interface concepts we saw in the 2002 movie Minority Report. I wonder how long it will take for this technology to reach consumers. I'm ready now!